Some of the grateful ones are making most of this criticism go against the political party Podemos, as if they were the standard bearer on this issue. There are those who claim that INDITEX’s deeds may not be moral, but they are all legal and, above all, Amancio Ortega has no need to make these donations. However, in the last 5 years, there have been facts over the table that should made us reflect on the legality of INDITEX’s actions. INDITEX has created several companies in Switzerland from which it buys its own production cheaply from countries like Bangladesh, Morocco or Turkey, in order to sell it more expensively to Spain. This makes that INDITEX companies based in Spain, where 30% is taxed, barely declare any profit. And this shell companies, located in tax havens, artificially generate stratospheric benefits … in some cases with hardly any employees !!. There are already MPs working for a new European law to stop this large-scale theft. Neither is it legal to use slaves in the production chain. And the Sao Paulo (Brazil) prosecutor’s office has officially determined that Zara has consciously used slaves in the country. The payment of a compensation of $ 1.5 million is for “the effective realisation of work under conditions analogous to slavery” . This was so, despite the maneuver of changing the headlines of the Spanish media which tried to turn the payment of a sentence into a fight against the child slavery. Just as if we now turn Sito Miñanco into a leader of the struggle against drugs because we have expropriated one of his houses to use it as a therapy center. Nor is it legal to use Syrian refugees in clandestine workshops in Turkey, as the British channel BBC has recently proved . Where the Spanish society saw a reason to demand a greater reception of the refugees who were escaping from war, Zara managers saw an opportunity to reduce costs. The great growth of the INDITEX empire has been forged in the first decade of this millennium thanks to the relocation of its production chain. This maneuver that made many other companies follow its footsteps. These relocations have contributed, to a large extent, to the fact that Spain has registered historical records of unemployment rate. Just if the profits of large Spanish companies had not been taxed in tax havens (INDITEX alone has saved more than € 585 million according to a recent report of the European Parliament), no cuts would have been necessary in Spain. When this company from Arteixo was already a big international business, it decided to make the big leap towards a savagely capitalist company (slavery, tax avoidance, financial speculation …). This has resulted in more unemployment, more cuts and some oncological equipment. 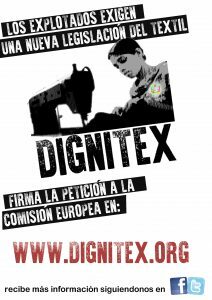 Being a good guy is being supportive with the victims who are being left on the ways of companies like INDITEX.